Adventures or particularly archaeological adventures have inspired many a game provider. This time it’s NetEnt who brings the adventure to our homes with the launch of “Lost Relics” this May. Visit Monster Casino to enjoy this visual extravaganza and enjoy the many bonuses they give to the players. 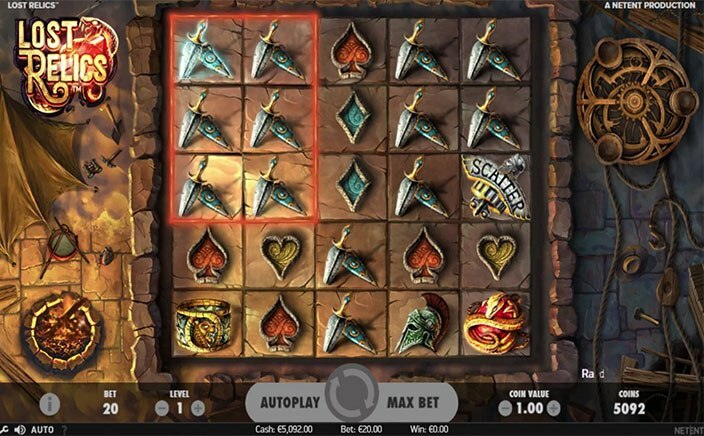 Lost Relics is a 5 reel, 5-row slot with cluster pay game engine. Cluster pay doesn’t have the concept of paylines. Instead of wins occur when 6 or more of the same symbol appear adjacent to each other in a cluster. It can be horizontal or vertical or even diagonal. The slot is filled to its brim with features like random game features and a bonus feature with free spins and a treasure chest. The game is visually pleasing and gives a breathtaking experience for the player and is set on an Indiana Jones-style temple ruin which houses ancient relics lost out to humanity. Our heroine is set out on an adventure to hunt for those relics. The symbols are the relics including a snake encasing a ruby, studded dagger, helmet and a warrior’s bracelet. Apart from these are the usual card symbols like a spade, club, heart and a diamond which are styled like relics. The snake is the highest paying symbol with a multiplier of 1000 on your stake when you get 25 of those on your screens. The Wild symbol is prominent with a “W” surrounded by a snake and the scatter is a shield with “Scatter” written across. The wild can replace all the symbols except the scatter. Lost Relics has a bonus feature with free spins and a treasure chest. But that is apart from the random game features. Coin Wins – Winning clusters can get you win up to x150 times your stake. Extra Wilds – During this feature, wilds get randomly placed on the screen. You can get up to 15 wilds on your screen. Extra Scatter – Scatters gets added to the cluster to help you reach 3 or more scatters which enables the Free Spins Bonus Feature. The bonus feature is initiated when three or more scatters appear on the screen. Not only do you get 10 free spins, you also get the treasure chest. You can find treasure chests big and small hidden behind your clusters. Once there is a winning cluster, it uncovers the hidden treasure chest which might have any or all of these prizes. Coin Wins – Cash prizes up to x30 times your wager amount. Sticky Wild – Wilds are randomly placed all over the screen which remains in place until this feature is over. Extra Free Spins – Free spins as mentioned in your treasure chest. 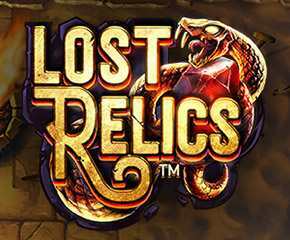 NetEnt has done it again with Lost Relics with an innovative gameplay and exciting bonus features; This is perfect for the players who would love an adventure sitting in the comfort of their homes.